Random House (Australia), 9781742756424, 376pp. It's been two years since Shyler O'Neil's beloved son Jesse was killed, but his final moments are as vivid to her now as they were that dreadful day. Suffering from post-traumatic stress, and convinced she did not do enough to protect him, she retreats to an isolated cabin in the woods of northern Maine. Meanwhile, Zack Ballinger--a 10-year-old boy who has never known a mother's love--finds himself in the wrong place at the wrong time. He has seen too much and is now running for his life. Fleeing into the woods, Zack soon finds himself at Shyler's cabin. He'll take whatever help she can give--even though, for some reason, she keeps calling him Jesse. With the pursuers hot on their heels, "mother" and "son" go on the run. Protecting Zack may well be Shyler's one chance at redemption--either that, or she is the child's greatest threat. Diane Hester is a former violinist with the Rochester Philharmonic. Born in New York, she now lives in Australia. 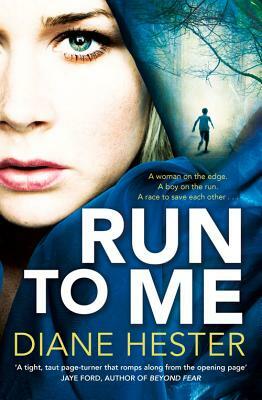 Run To Me is her debut novel.